The essence of a home is found in its unique features, the little special touches that make it different – make it yours. Opportunities abound in Western Carolina for these elements. 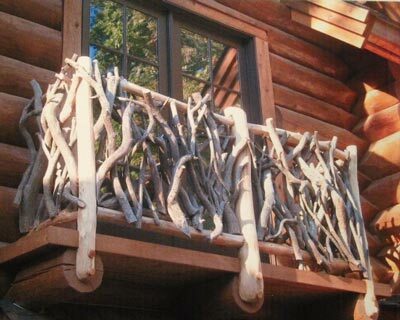 With a bit of vision, mountain laurels become stair railings, pickets, and accents. Locust tree trunks can be transformed into support posts inside and outside your home, or even planed for dramatic flooring. Barnwood repurposed as paneling, bookcases, and mantels are one-of-a-kind additions that are a joy to design and build. Or how about an old milk bucket drilled through to become not just a half-bath sink, but a conversation piece? Dearman Mountain Homes specializes in custom built log homes and mountain homes. We serve the Asheville, North Carolina and Western North Carolina area. © 2019 Dearman Mountain Homes. All rights reserved.